Taking a wonderful vacation is not just for the whole family or big group of friends. There are many people who are living by themselves alone can also take a wonderful vacation to experience a relaxing atmosphere and to focus on themselves while enjoying the great surroundings. In Branson there’s a great place suitable for some people who want to spend a fantastic vacation alone. This is a one bedroom log cabin at Thousand Hills Golf Resort that can be a perfect accommodation for a solo vacationer as the place is beautifully located in a secluded area with a beautiful view of the natural scenery and wildlife along the foothills of the Ozark Mountain. If you are one of golf enthusiasts spending a wonderful vacation at Thousand Hills, the great location of one bedroom log cabin is just right for you as a solo vacationer because the place is home to the most popular 18-hole golf course in Branson. While you are just alone in your accommodation near the golf course you always have the convenience and easy accessibility to come to the golf course to see or participate in a challenging game of golf playing. You can also have the chance to enjoy other exciting activities around as Thousand Hills features indoor and outdoor pools, fitness center, and arcade games. This cozy one bedroom log cabin at Thousand Hills is perfect for everyone who wants to spend a peaceful moment in a relaxed atmosphere. Staying in log cabins at Thousand Hills gives you the opportunity to live conveniently, luxuriously, and comfortably in a spacious area of 675 feet. With great features of top quality amenities including free wireless internet access, cable TV with HBO, and a DVD player, even if you are staying alone in this beautiful accommodation, you don’t have time to be bored. While you are living alone by yourself in this great lodging place, you don’t have to go out for dinner as you can prepare your own food in a kitchen fully furnished with modern home appliances. 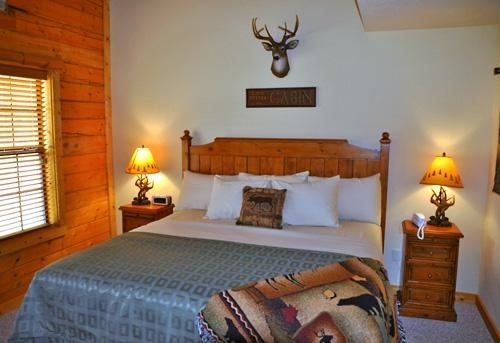 The luxurious and comfortable living you will experience in a one bedroom log cabin at Thousand Hills Golf Resort will let you think of coming back another time. Despite the location of these log cabins in a secluded wooded settings, these are actually near the Highway 76 Strip where live entertainment shows and exciting attractions abound. Strolling alone around Branson can be more fun as you will find many sorts of world class live entertainment performances and movie shows. If you want to be titillated with old classics, come experience the fun and watch the Andy Williams Show with the beautiful performance of Ann Margaret or get inside the Moon River Theater where you can see musical variety show and many wonderful performances. So, if you want to spend a wonderful vacation in Branson by yourself alone, stay at one bedroom log cabin at Thousand Hills Golf Resort as its beautiful ambiance allows you to experience a complete relaxation.